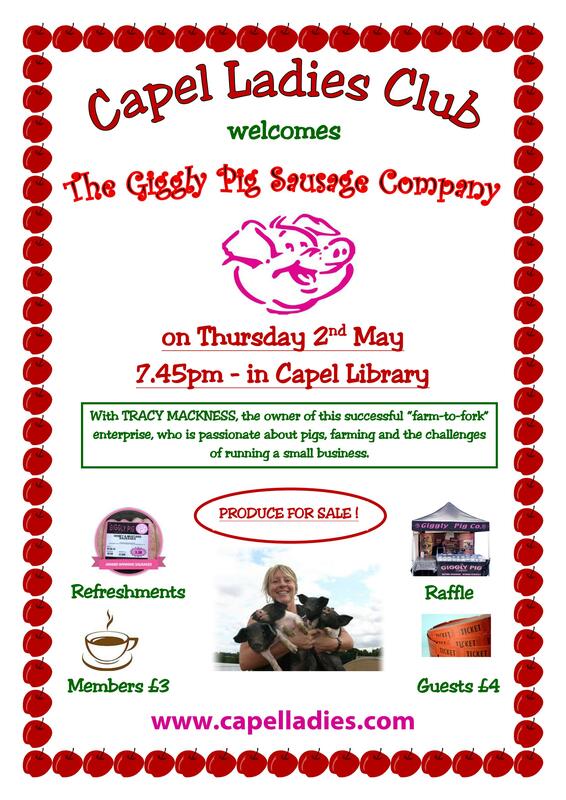 Capel Ladies Club | Who we are, what we do and how to join us! Welcome to the Capel Ladies Club website! We hope you will enjoy your visit. You can find out all about us and what we do at our meetings. There are reports to read and links to other websites of interest. You can view our 2019 Programme and see whether you would like to Join Us. See Sue, I told you I read it! Hope I get some good feedback after the December In Meeting!!!!! Thanks for your comment, Linda! Anyone else feel like adding a few words? I hope the members who came last Thursday enjoyed the evening. The evening was delightful for me as the “speaker” as it always is when others seem to get pleasure from what they do. I’m sure everyone who receives one of their cards will be impressed – I certainly was. Would anyone else care to add a comment or remark of some kind about our Outings or “In” Meetings? Or maybe a suggestion for future gatherings? Please feel free to do so! It would be nice to get some more feedback! Hi Sue, I hope your finger is better. Thank you all for arranging the visit to Viridor. Most informative. Sorry it didn’t work out as planned for you! Hi Linda! Thanks for asking about my finger! It’s feeling a lot better now and I feel very lucky that I didn’t lose my nail or end up with a broken finger joint! Glad you enjoyed the visit too, and the ladies who took us round were very good I thought . They were friendly as well as informative. See you at the social! Thank you to Shirley for arranging the outing to Sandringham. It was a lovely day. Can I suggest that for future outings the committee makes sure that no-one spends the day by themselves. It is very dispiriting to wander by yourself for many hours..It rather takes the shine from what could be a happy day. We are sorry, Linda, that after knowing lots of us for so many years you didn’t feel able to ask someone if you could join them! Any of us would have been delighted to have enjoyed Sandringham with you! Perhaps the rest of us should also have been more observant of the fact that you were on your own. Thanks for your suggestion, we will be more aware of this on future trips. Sorry to have missed the BBQ as I was away camping in Henley-on-Thames. ( nearest site to Legoland!) Glad you had good weather for it. I shall not be at the Sept. 5th indoor meeting – allergic to cheese. but please put me down for the Indian cooking demo. Will do, Jacky. Hope you had good weather while you were camping! See you at the Indian Cookery evening! The Suffolk Cheeses evening was most enjoyable with a very witty speaker. Needless to say the evening was enhanced with a glass or two of wine to compliment the cheese tasting. Very good Sue. Enjoyed looking all the photos. Keep up the work. Sue, Thank you for the email Christmas Card. The teddies were nearly as good as we were! Sorry I didn’t make it to the Social -yet another bug! Happy Christmas to you and all your family and see you in 2015! Thank you for your comments. Others on the trip have also sent positive messages and thanks about the trip. Thank you so much to all the “ladies” who came and gave generously last night. EACH will certainly be the richer for your very generous contributions for the cards and the Craft Evening. I am always a bit apprehensive about craft evenings and wonder if anyone will come. But come you did! What stars you are. It is always such a joy to me to hear your chatter and laughter on these occasions! Hope you all enjoyed it as much as I did! Keep crafting girls! See you in November/December 2016! Thanks, Linda, for a very enjoyable and therapeutic evening! I hope we ‘ll see you BEFORE Nov/Dec next year!! Glad you were pleased with the members’ donations! Thank you Sue and everyone on the committee for arranging our Christmas meal last night. Good food, good service, good company AND a Grotto! All that was missing was a visit from Father Christmas – but I expect he is very busy! Thanks, Linda, for your favourable comments. I hope everyone had a good time and enjoyed their meals too! The staff at Acorn Village certainly made us feel very welcome, and – as you say – the grotto was amazing! Thank you Sue for arranging a lovely night out with a delicious meal last night. I thought the staff at the Brook did a wonderful job considering how busy they were. Personally I have no complaints. I’m very glad you enjoyed the evening, Linda. I think from the general atmosphere it was a fun evening out, and the staff at The Brook responded very well to any criticisms we had and put them right. It is always difficult to select a suitable, local meal venu for such a large number of people, but I think everyone had a good time. Thanks, Shirley – and thank you for visiting our website! It’s good to get members’ feedback! Thank you to all the members who attended last night, it is always so nice to craft with such a jolly crowd! I hope you all enjoyed it as much as I did. Thanks to the generosity of all those who bought Christmas cards, we can send £25 to EACH. We always enjoy a craft session, Linda – it gives everyone a chance to have a good natter! Thanks again for organising it for us! (And for bringing the delicious home-made chocolate slab for us to sample!) Glad you made some money for EACH as well! Thank you to all the committee for a superb evening to celebrate 50 years.You must all be very proud of what you achieved on such an auspicious occasion. What a lovely evening! Thanks Linda for your kind comments. it really was a fabulous night and everyone looked so good in their golden outfits.My thanks to all the committee too, they did work so hard to get the rooms decorated and looking so good plus everything they did before the night too. Only 10 years till the next big celebration!!! Looking forward to sitiing on the back row tomorrow rather than standing at the front! Many thanks to all of you for your support while I have been chairlady, I hope you will continue to support the new committee – or even join it!